Welcome to another happy Thursday! Today I want to talk about something plaguing the blogging society, and that is word verification. It's time consuming and unnecessary! Blogger has an awesome spam folder that WILL catch anything before it's published on your blog. You may get a few spam hits at first, but it will die down. When I started this blog I thought I had word verification off. Turns out, I didn't. Blogger's new format doesn't allow you to. So in the interest of other bloggers ridding themselves of word verification I thought I would give everyone a little how-to on fixing the problem. You will return to your old dashboard. Find your blog and click on the 'Settings' button. Once there, click on the comments sub-button. You can go back to the top and change your settings back to the new interface. Everyone should check to see if they are using word verification. It will never ask for verification from the author of the blog so you might not know you have it. Anyone else have blogger pet peeves? I didn't know that my blog had word verification until a 'crit my blog' blogfest follower pointed it out. While it doesn't keep me from commenting on other blogs, W V is irritating. Thanks for the simple steps needed to eliminate it. Brilliant, thanks for that - I've turned mine off. It is irritating when commenting, and I've always wondered how much spam it saves. I guess I'll find out soon. I wonder what other things you can do on the old interface that you can't on the new? I used to get a tonne of spam before word verification. It was either that or having to approve every single comment. Oh, I forgot to say I'm in the campaign with you. Sci Fi category. wait till you see my a to z posts! Fellow Campaigner here. Thanks for the great tip! I didn't even know I had it. Although I don't mind it that much on other blogs. I store the weird words the verification comes up with and use it for naming items or concepts in my fantasy worlds. It's fun. Thank you so much for doing this J.A. I am a wordpress user. While I try to comment on as many blogs as I can, word verification is a pain. I've encountered some (blogger) blogs that have multiple verification and you know what? Wasn't worth the time consumption, so I moved on to the blogs that are more user friendly. I do encourage bloggers to remove word verification. Ha! I thought I turned it off long ago, btu apparently not. It's not the end of the world to me to do it on blogger since blogger's is at least a lot easier to read than a lot of other places but...I also don't think it helps that much in the long run. Guess we'll see. By the way, following you from the campaign! The awesome Sophia Chang pointed out the word verification being on my blog a while back. Had to figure out how to undo it, but it's been worth it. This is great that you're sharing the steps on how to do this. Yes! Thank you for joining my and Sophie the Writer's campaign to turn this off. It is unbearable trying to manage it on phones and iPads. I did a post on this a month ago. Hallelujah! I'm glad someone else hates it too! 100+1=me.....Thanks for this post, I am so sick of proving that I am not a robot! I hate wv, I've always assumed it's switched off on my blog, but I'm off to check now. I appreciate that you also go through and show what everything looks like. Thank you so much for posting this - word verification drives me CRAZY!!! Turned mine off awhile ago, it's rather annoying. Hey! I'm stopping over from the campaign, it's great to meet you too! Thank you for your easy to follow instructions. This is a my biggest blogging per peeve. I hate it and I see it so often. I am sure that people probably hate my comment section as well, because I use DISQUS (I am switching back to blogger as soon as my Get Fired up Blogfest ends-don't want to lose any entries in the comment section). I wonder if I will have to revert back to the old blogger to ensure it is off when I switch back to blogger. Thank you again. I have one other pet peeve. I hate when someone new follows me and I cannot link to their blog by clicking on their photo or name. Sometimes it just takes me to a blogger profile that does not list their blog. I don't know how to return to follow favor, but I have given up tracking people down. I try a few ways but their is only so much time to spread around. I hate word verification!! I can NEVER get the words right the first or second time! I'm going to have to do this, I had no idea when the new blogger came about that it automatically did this. Helpful post! I'm Melissa Maygrove, one of Rach's campaigners coming over to say hello. Nice to meet you. This is something that people have recently been pointing out as annoying. I'm glad you did a post on this. I didn't realize what a pain those things were until the latest blogfest I participated in. Hmmm....I'm going to have to check my blog. Thanks for the helpful post! Hi, I'm by from the SF group on the platform building campaign but given this post I have to ask another question. I'm on wordpress, and while I have no trouble commenting if the "select profile" includes a name-URL option, half the time when I try to use wordpress as my profile, blogger blogs simply do not recognize it. I just get thrown back to the input page. Or the software tells me I don't have the captcha right, even after several tries when I'm being very careful. Some blogspot blogs do not have the name-URL option. Yours does--what makes the difference? PS, if you visit my blog, let me know if comments and/or subscribing are easy. I don't know how it looks to others. That's an interesting article. I think I have mine turned off. Hope it is (I'll have to check) because I think they are so annoying as well. I allow for anonymous comments which gives you the ability to do the name-url thing. I can't think of why it wouldn't take your Wordpress profile, but I do know that I have had issues commenting on blogs when I am using internet explorer. If you have firefox or google crome you may run into less issues. Another thing that might help is getting a google + page started, becasue then you will have a google account and blogger won't give you any problems. 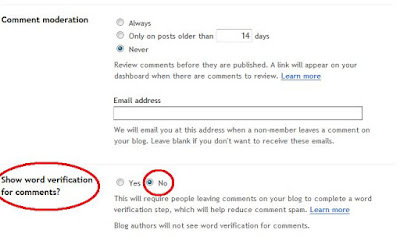 As far as your blog goes, a lot of blogger users don't know the RSS button subscribes them to your blog. You might want to consider adding a caption to the RSS that says "follow me here!" to make it really simple. Commenting was no issue for me since I have both a wordpress and twitter account. Hope that answers your question! Ooh! Thank you for posting this. I'll head to my blog now and make sure it's turned off! 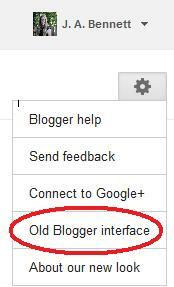 I don't know why, but don't have the option "Old Blogger interface". :(((( These new double captchas do annoy my readers so much that some of them won't comment any more. Really? That is beyond retarded. I hate the new verification too, I almost want to give up with it. But if you're having that issue, I don't know what to tell you. But I would contact Google, becasue that makes me really mad! I LOVE YOU! lol! Seriously, I have been trying to figure this out forever. I finally googled it and found you. Thanks for putting this up. I am now a new follower! Just visited Tracy Jo's blog and noticed her comment re WV. Thank you so much for taking the time to inform us about this. 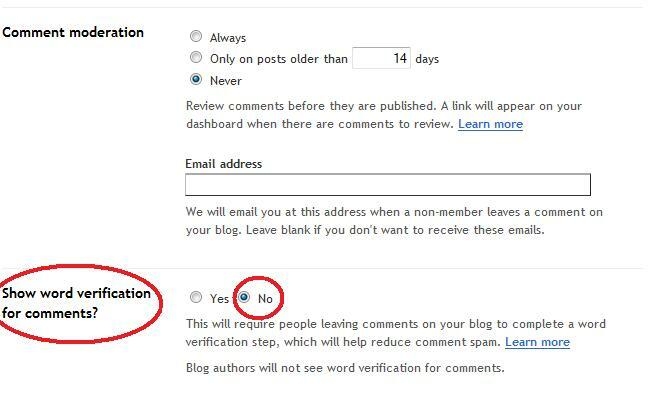 I certainly wasn't aware that my blog had this requirement for those wishing to leave a comment......I know how difficult they can be to read sometimes and it can almost be a deterrent. Best wishes. Yep, word verification is (one of) the bane(s) of my existence, especially with the new images! Brilliant thank you so much.I just found your blog by googeling how to get rid of verification.And I found your lovely blog too. I don't have the Old Blogger interface either. I'm pretty sure I don't have word verification on as I did switch it off on the old interface. It's annoying that I can't check though. same here, thanks for showing us what to do. It drives me up the wall on other peoples blogs as I find it hard to decifer what the words are with that silly font. You did such a great job of explaining this. I was thinking about writing a similar post, but maybe I'll just link here! Now, if you don't mind, can you explain how you have the ability to reply to comments within the comments section? It would be nice for when I get a question from a no reply email. Thanks for the tip. I looked everywhere in the new interface trying to turn it off! THANK YOU! I didn't know I had WV either until a commenter pointed it out. you made it easy. Wonderful! I've been urging bloggers to shut off Word Verification. Now I know where to send them to find out how. Thanks for the heads-up - just got around to turning it off. It is something that annoys me on others' blogs, but I didn't know it was still on mine!!! Thank you! Followed your instructions and got rid of word verification. I didn't know it was on in my blog until someone told me. I am so annoyed b/c I do not have that option to go to the old Blogger interface either. I have been trying to turn word verification off for a couple of months now and I can FIND NO WAY TO DO THAT . It is so frustrating. I had no idea that word verfication was on in my blog. THANK YOU! Thanks so much. This was a great help! like many others, i did not know wv was turned on until a kind soul told me. thanks a million for your tutorial. just followed your tutorial. one last thing to be added before going back to new interface--SAVE CHANGES. thanks again for taking the time to post this. Anyone know where I can find the new area to change my blogger back to the old interface so I can do this? It's not in the drop down menu of the cog on my dashboard anymore and a visitor to my blog just let me know there was captchas on my which I had no idea.